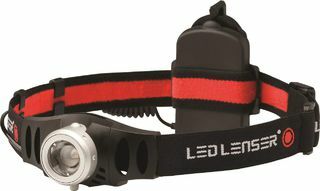 The Ledlenser H3 headlamp is a lightweight, value for money, versatile headlamp. The H3 features a dimmer switch for ease of use in different situations. The lamp head can tilt up to 90 degrees to ensure the light is where you need it. Due to optimised weight balance and the soft headband, the wearer stays comfortable, even for long periods of time. 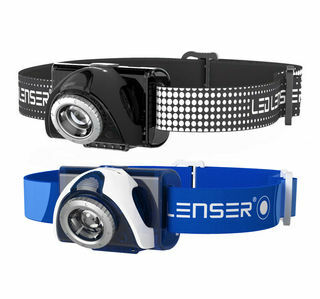 Backed by Ledlenser's 5 year warranty. Comes with: neoprene pouch with belt loop, 3 x AAA batteries. The H7R.2 is an upgraded version of the popular rechargeable H7R headlamp. It is brighter, smarter, more durable and comfortable than the previous model. The H7R.2 incorporates some of Ledlenser’s latest technical advancements like Smart Light Technology, where you can customise your headlamp by choosing between three light programmes, with five different light functions. A major new feature of the H7R.2 is the multi-function 'Wheel Switch' at the back. This lets you seamlessly adjust the light intensity (or flashing rate if you are using the signal light function). It also offers you increased safety with a built-in optional light that has both an on and blinking function, plus provides a battery indicator that lets you know how much life your batteries have left. The H7R.2 also has a built-in USB port for easy recharging. Other improvements include an upgrade of the tilting mechanism, so it is now even more durable. The button is larger and made of rubber. The cabling of the H7.2 has also been completely revised, with particular focus on strengthening the areas exposed to a lot of strain. The H7.2 also features a transport lock so it can’t turn on by accident – great in a pack. The H7R.2 is also a step up in comfort. Recognising the fact that everyone has a different shaped head, the H7R.2 headband is designed so it can be adjusted to fit your unique head shape perfectly. The battery case is molded to suit the shape of the head, while the ‘skin-friendly’ material adapts itself to every user. It is so comfortable, you’ll forget that you are wearing a headlamp. For ultimate versatility, the H7R.2 can also run on standard AAA batteries. 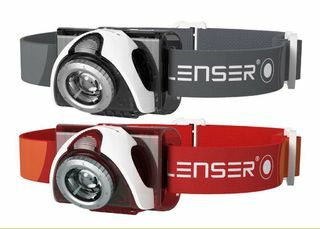 Covered by Ledlenser's 5 year world-wide warranty. Ledlenser’s design team in Germany took their best-selling H7 headlamp and set themselves a challenge – to make it even better. The result is the H7.2, an incredible headlamp that blows its predecessor out of the water. It is brighter (250 lumens on boost, compared to 180), with a greater beam range and what’s more it’s smarter too. 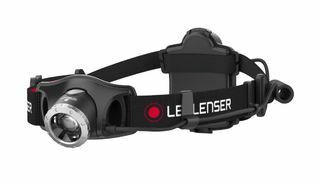 The H7.2 incorporates Ledlenser’s latest technical advancements like Smart Light Technology, where you can customise your headlamp by choosing between three light programmes. It also has a low-battery message system,and a multi-function ‘Wheel Switch’ which lets you seamlessly adjust the light intensity (or flashing rate if you are using the signal light function). Other improvements made include an upgrade of the tilting mechanism, so it is now even more durable. The button is larger and made of rubber. The cabling of the H7.2 has also been completely revised, with particular focus on strengthening the areas exposed to a lot of strain. The H7.2 also features a transport lock so it can’t turn on by accident – great in a pack. The H7.2 is also a step up in comfort. Recognising the fact that everyone has a different shaped head, the H7.2 headband is designed so it can be adjusted to fit your unique head shape perfectly. The battery case is molded to suit the shape of the head, while the ‘skin-friendly’ material adapts itself to every user. It is so comfortable, you’ll forget that you are wearing a headlamp. Comes with Ledlenser's 5 year world-wide warranty. 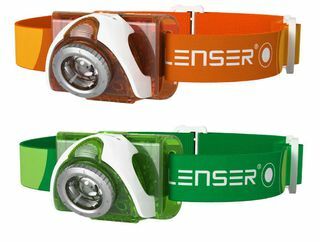 The H6 headlamp offers the user-friendly performance Ledlenser is known for. Features include Ledlenser’s Advanced Focus System for seamless transition from a broad floodlight to sharp long-distance beam. The 90 degree tilting head and sliding dimmer switch are easy to use with one hand. The strap is specially designed to sit firmly on your head, with two non-slip rubber strips on the headband, and an additional overhead strap that can be attached if required. All Ledlenser products are designed in Germany and are covered by a 5 year warranty. Comes with: neoprene pouch with belt loop, optional overhead strap, 3 x AAA batteries. 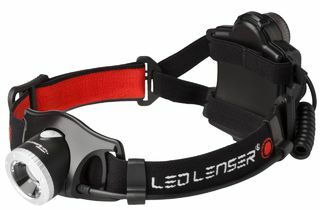 The Ledlenser H5 is a great everyday headlamp. It features Ledlenser's Advanced Focus System, with a seamless transition from a broad floodlight to a sharply focused long-distance beam. The light beam is effective up to 70 metres and you can adjust the head so you get the light exactly where you need it. Other features include a red LED light chip in the battery box at the back which makes the wearer visible from behind – great for cyclists and runners. Water resistant, it has an easy to use on/off switch and adjustable straps. Covered by Ledlenser's 5 year warranty. Comes with: neoprene pouch with belt loop, 3 x AAA batteries. The H14.2 incorporates both comfort and performance to create a superior light, designed specifically to accommodate the needs of professionals and adventure seekers alike. The updated version was specially constructed with an aim to increase usability and flexibility, featuring new cabling and a multi-function switch to alternate light modes with ease. With 350 lumens, the H14.2 is not only bright – it’s easy to wear and dependable, no matter what the job or activity. All Ledlenser products are covered by a 5-year standard warranty, which can be extended to 7 years by registering the product. The incredible NEW XEO 19R from Ledlenser's German design team is the ultimate in headlamps. It is overflowing with features that deliver incomparable performance and usability. With a mind-blowing 2000 lumens of brightness, and with a lamp head weighing just 193 g, it represents the next step in the evolution of headlamps. It features a world first - two LEDS that can be focused separately and their brightness controlled individually.Why choose between a floodlight or focused spotlight when now you can have both at once? The XEO 19R is packed full of features. It is incredibly easy to operate with a NEW 5-way switch that lets you switch easily between the 5 different light functions. One of the light functions on offer is OPTISENSE technology, where the light automatically adjusts to the surrounding environment. 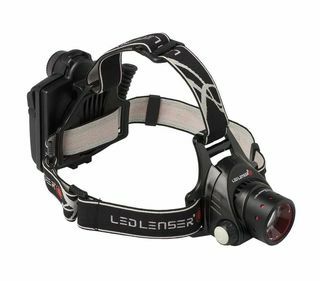 Another Ledlenser innovation is Speed Cooling - as the speed of the user increases, the increased airflow helps to cool the headlamp. This allows the headlamp to generate brighter light at higher speeds. The rechargeable power pack is detachable, enabling the XEO to easily change into a hand-held or bike light. You can also charge other devices like smartphones and digital cameras from it. Ground-breaking. Revolutionary. Just what you expect from Ledlenser. 5 year warranty. A rechargeable version of Ledlenser's H14.2 with a staggering 1000 lumens of light and a 300m beam range. The design of the H14R.2 means that Ledlenser's patented Advanced Focus System provides an incredible performance, with a seamless transition between a stunning evenly lit floodlight providing excellent illumination at close range, and a wide focused area in the long-distance beam. You can customise the H14R.2 to suit your exact needs with Smart Light Technology, which offers 3 light programmes (offering 5 different functions) along with 2 energy modes. The multi-function wheel switch on the battery box makes it easy to switch between light programmes plus offers seamless dimming and the ability to change the flashing rate of the signal function. Other additional features are an optional rear safety light, a battery indicator that lets you know how much life your batteries have left plus a built-in port for easy recharging. For ultimate convenience it also operates on standard AA batteries. Covered by Ledlenser's 5 year warranty. Introducing the NEW NEO Headlamp, an incredibly lightweight and bright headlamp that is perfect for jogging, walking, tramping, multisports, reading or any other activity that requires a reliable light source after dark. The NEO features a wide beam reflector that produces a wide angle beam that provides extremely bright close up light. As a person’s natural field of vision is more horizontal than vertical, this means a greater portion of what you are looking at will be illuminated. Another benefit of the oval shape of the headlamp and the wide beam reflector is that you can be seen from more angles, making the NEO safer than traditional headlamps. An extra safety feature is the optional red blinking LED light on the battery pack, which means you can be seen from behind. 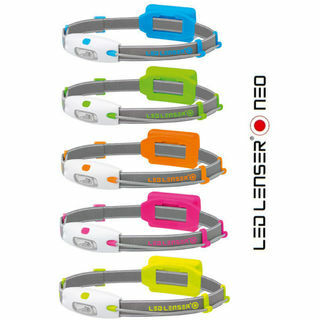 The NEO is Ledlenser’s lightest headlamp (only 54 grams without batteries) so you will hardly notice you are carrying it. It operates on 3 x AAA batteries (included) but will also work on rechargeable AAA batteries. Covered by Ledlenser's 5 year warranty.